Mosaddegh, M., Esmaeili, S., Eslami-Tehrani, B., Kermatian, B., Mohebby, S., Hamzeloo-Moghadam, M. (2015). Anti-angiogenesis properties of Crocus pallasii subsp. haussknechtii, a popular ethnic food. Research Journal of Pharmacognosy, 2(3), 37-42. M. Mosaddegh; S. Esmaeili; B. Eslami-Tehrani; B. Kermatian; S. Mohebby; M. Hamzeloo-Moghadam. "Anti-angiogenesis properties of Crocus pallasii subsp. haussknechtii, a popular ethnic food". Research Journal of Pharmacognosy, 2, 3, 2015, 37-42. Mosaddegh, M., Esmaeili, S., Eslami-Tehrani, B., Kermatian, B., Mohebby, S., Hamzeloo-Moghadam, M. (2015). 'Anti-angiogenesis properties of Crocus pallasii subsp. haussknechtii, a popular ethnic food', Research Journal of Pharmacognosy, 2(3), pp. 37-42. Mosaddegh, M., Esmaeili, S., Eslami-Tehrani, B., Kermatian, B., Mohebby, S., Hamzeloo-Moghadam, M. Anti-angiogenesis properties of Crocus pallasii subsp. haussknechtii, a popular ethnic food. 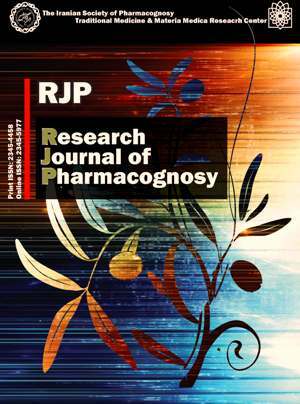 Research Journal of Pharmacognosy, 2015; 2(3): 37-42. 2Food and Drug Organization, MOH & ME, Tehran, Iran. Background and objectives: Angiogenesis is essential for tumor survival. Inhibiting angiogenesis could be a mechanism for hindering tumor development. Numerous studies have now been focused on agiogenesis inhibitors and many of such studies have targeted plant materials. In the present study, Crocus pallasii subsp. haussknechtii has been evaluated for anti-angiogenesis properties. Methods: Anti-angiogenesis activity of the plant extracts and fractions has been investigated through wound healing assay in HUV-EC-C cells. The cytotoxic activity has also been evaluated by MTT assay. Results: The methanol extract and the methanol fraction of the corm along with the chloroform fraction of the aerial parts demonstrated to be cytotoxic to HUV-EC-C cells with IC50 values of 27.2, 74.1 and 60.0 μg/mL, respectively while the chloroform fraction of the corm showed the most considerable anti-angiogenesis property among the samples in wound healing assay. Conclusion: Regarding the results of the present study, Crocus pallasii subsp. haussknechtii is suggested for further studies in cancer research evaluations. Wu H, Yao Z, Bai X, Du Y, Lin B. Anti-angiogenic activities of chitooligosaccharides. Carbohyd Polym. 2008; 73(1): 105-110. Bian W, Chen F, Bai L, Zhang P, Qin W. Dihydrotanshinone I inhibits angiogenesis both in vitro and in vivo. Acta Biochim Biophys Sin. 2008; 40(1): 1-6. Lee MS, Moon EJ, Lee SW, Kim MS, Kim KW, Kim YJ. Angiogenic activity of pyruvic acid in in vivo and in vitro angiogenesis models. Cancer Res. 2001; 61(8): 3290-3293. Naghibi F, Khalaj A, Mosaddegh M, Malekmohamadi M, Hamzeloo-Moghadam M. Cytotoxic activity evaluation of some medicinal plants, selected from Iranian Traditional Medicine pharmacopoeia to treat cancer and related disorders. J Ethnopharmacol. 2014; 155(1): 230-239. Hamzeloo-Moghadam M, Hajimehdipoor H, Saeidnia S, Atoofi A, Shahrestani R, Read RW, Mosaddegh M. Anti-proliferative activity and apoptotic potential of britannin, a sesquiterpene lactone from Inula aucheriana. Nat Prod Commun. 2012; 7(8): 979-980. Guan JL. Cell migration: developmental methods and protocols. Totowa: Humana Press Inc., 2005. Auerbach R, Lewis R, Shinners B, Kubai L, Akhtar N. Angiogenesis assays: a critical overview. Clin Chem. 2003; 49(1): 32-40. Moshtagh S, Baharara J, Zafar-Balanejad S, Ramezani T. Antiangiogenesis effect of saffron extract (Crocus sativius L.) on a Wistar rat aortic ring model. J Shahrekord Univ Med Sci. 2014; 16(3): 79-88. Mousavi M, Baharara J, Shahrokhabadi K. The synergic effects of Crocus Sativus L. and low frequency electromagnetic field on VEGFR2 gene expression in human breast cancer cells. Avicenna J Med Biotechnology. 2014; 6(2): 123-127. Mousavi M, Baharara J, Zafar-Balanezhad S, Shaheokh-Abadi K. Effect of saffron aqua extract on angiogenesis in chick chorioalantoic membrane. Zahedan J Res Med Sci. 2014; 16(3): 55-58. Umigai N, Tanaka J, Tsuruma K, Shimazawa M, Hara H. Crocetin, a carotenoid derivative, inhibits VEGF-induced angiogenesis via suppression of p38 phosphorylation. Curr Neurovasc Res. 2012; 9(2): 102-109.